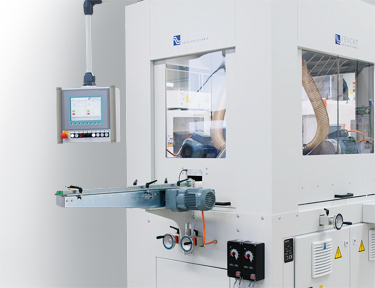 HK - KOTI deburring and brushing machines are predominantly special-purpose machines engineered and implemented in cooperation with competent mechanical engineering partners in compliance with the specific requirements of our customers. Our machines are predominantly found in the metal processing industry. The rotary head deburring machine is designed specifically for the economical, process reliable de-burring of separation and cut edges, for instance in square and profiled materials made of steel, VA, non-ferrous metals or plastic. The machine operates with a brush array, optionally fitted with wire or nylon abrasive filaments, comprised of several individual discs. This design allows the ideal brush width to be selected for any material dimension in continuous operation. The rotation head allows material dimensions in Ø of 10 – 200 mm, square profiles of max. 140 x 140 mm and rectangular profiles with a maximum edge length of 170 x 100 mm to be deburred in a single clamping operation. The minimum length should be 75 mm. For greater edge lengths, an optional clamping unit is available. This clamping unit makes it possible to arrange the rotary head for horizontal oscillation at the workpiece, allowing profiles of up to 400 x 200 mm to be machined in a single clamping operation. 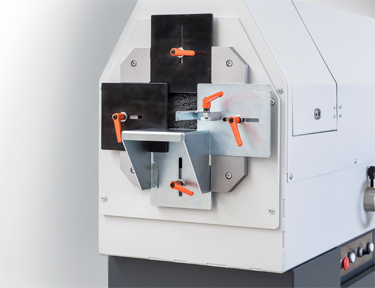 The centerless deburring machine is an ideal deburring device for centerless deburring of ground circular components with and without leading edges. The machine comes with a complete enclosure and can be used either in wet or dry operation. The choice of brush filling can play an influencing role in the deburring result. Depending on customer requirements, several deburring units can be used in series or with a cross conveying system.